Happy Friday! If you were out and about this morning, you may have seen the crowd gathered on the lawn of the old Frederick County Court House. The Shenandoah Valley Battlefields Foundation (SVBF) held a ceremony to officially announce that the former Old Court House Civil War Museum is renamed the Shenandoah Valley Civil War Museum. The exhibit areas in the museum will be upgraded with new and renovated exhibits, improved signage and displays, new interactive and digital tools, new lighting, new youth activities and exhibits, and a greater focus on the broader story of the Civil War in the Shenandoah Valley – the Union, Confederate, civilian and African-American perspectives. Winchester Mayor John David Smith, Jr., Congresswoman Barbara Comstock, Delegate Chris Collins, SVBF Board Member Jim Wilkins, Jr., and SVBF CEO Keven M. Walker among others made remarks on the museum, its history, the changing of the exhibits and way it can enhance and expand upon the interpretation of the Civil War past the experience of names and dates at a battlefield. 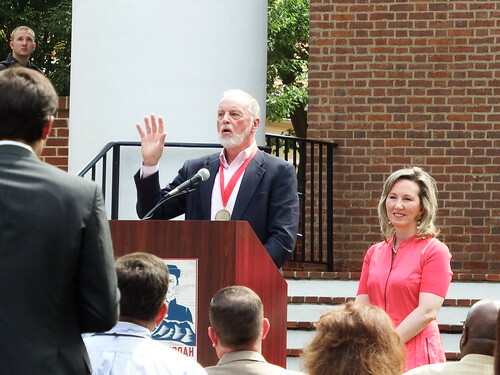 At the end of the proceedings, Mr. Wilkins was presented with the Graves Family Philanthropic Leadership Award in recognition of his philanthropy on behalf of battlefield preservation and other worthy causes. Be sure to stop by the Shenandoah Valley Civil War Museum at 20 North Loudoun Street (most exhibit upgrades will not take place until winter, so there is still plenty of time to visit) or check them out online at civilwarmuseum.org. If you couldn’t make the event today, you can see twelve images of the ceremony at PHW’s Flickr account. 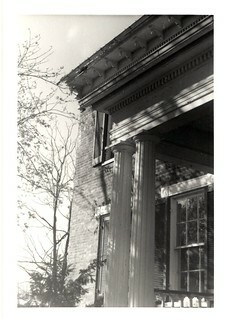 This week, PHW has added 47 photos of the Millbank House on Route 7 to the Flickr account. The images were dated between November 1984 and March 1986 as PHW volunteers documented the farm and advocated against demolition as part of the plans for a nearby water treatment plant. 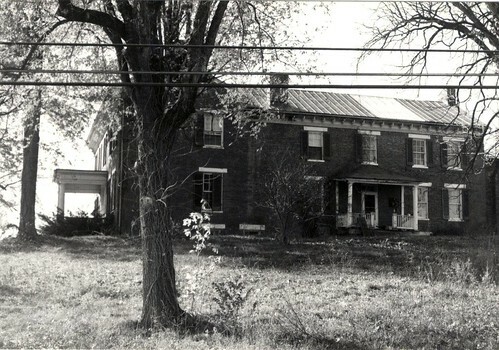 The house was constructed circa 1850 by Issac Wood and his son Daniel T. Wood. The Woods owned several mills along the nearby Red Bud Run. Because the Wood family were Quakers, abolitionists, and Union sympathizers, General Robert H. Milroy issued a protection order for the property in 1863. The house was heavily involved with the Third Battle of Winchester and served as a makeshift field hospital in the aftermath of the fighting. Daniel Wood continued to live at the home until his death in 1915, and his heirs retained the property until 1964, when it was sold to Robert Koon. The ongoing preservation battle began in 1983 when the Frederick-Winchester Service Authority condemned the 88 acre dairy farm for a new water treatment plant. The last owner, Robert Koon, Jr., was forced to vacate the property in May of 1984. Despite numerous offers from private individuals to purchase the house and either relocate or renovate it, Millbank languished and suffered vandalism of key architectural features while teetering on the edge of demolition for two years. In the end, only the threat of losing the federal funding for the treatment plant – reported as 75% of the $22 million project in 1986 – if the house were demolished appears to have halted the push in the 1980s. The issue continued to resurface from time to time as the house further decayed. The house and three acres of surrounding land has at last found its way into preservation-friendly hands with the Fort Collier Civil War Center in 2013, which was founded to preserve the earthworks of another important Third Battle of Winchester site. It was added to the National Register of Historic Places in 2014 for its significance during the Third Battle of Winchester. Efforts to stabilize and weatherproof the house are ongoing. Learn more about the current condition of Millbank at the Fort Collier website. See the documentary images of Millbank taken by John G. Lewis from 1984-1986 at Flickr. Opening weekend at the Kernstown Battlefield is this Saturday and Sunday, May 7th and 8th! Please meet at the Visitors Center for the regularly scheduled battlefield tours on Saturday at 11 am and 1 pm. In addition to tours of the battlefield, the 1854 Pritchard House, the museum and artillery building, the Liberty Rifles will be presenting a living history all weekend. The living history event’s interpretation will focus on May of 1861, and the organizing of local Winchester citizens into state service following Virginia’s secession from the Union. The participants will represent volunteers who would eventually muster into Confederate service as Company D, 33rd Virginia Infantry. These men, largely from the Winchester area, would serve in the Stonewall Brigade and fight at both Kernstown battles. Tours Include: The battlefield, the 1854 Pritchard House, the museum and artillery collection. For those in need, a golf cart is available to lend assistance. Cost: All programs are by donation. Other Information: The Kernstown Battlefield Association is an all-volunteer, non-profit preservation organization. Tours can be arranged throughout the year by contacting the KBA. They have a gift shop with diverse items for purchase, and can accept checks and credit cards. For more information visit www.kernstownbattle.org or Facebook, or by phone at (540) 869-2896 or (202) 302-9129. WHEN: Saturday, April 16th & 23rd, 2016, beginning at 9:00 a.m.
History buffs, community leaders and preservationists will team up with the Civil War Trust at more than 125 sites in 29 states to answer the call to service on Park Day. Celebrating its twentieth year, Park Day has attracted volunteers of all ages and abilities bound by their dedication to serving their communities at historic sites nationwide. In Winchester, Kernstown Battlefield Park will host a Park Day event beginning at 9:00 a.m. on April 16 and 23. Needs range from painting, grounds maintenance, minor building repair to seeding of new grass around Park Buildings. A local historian may also be available to describe the park’s significance. For more information about Park Day at Kernstown Battlefield Park, please contact Dave Jenkins by phone at 540-247-3362 or by e-mail at djenkins0849@outlook.com. The Civil War Trust is the largest and most effective nonprofit organization devoted to the preservation of America’s hallowed battlegrounds. 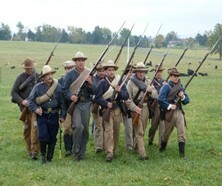 For a complete list of participating Park Day sites around the country, visit Civilwar.org/parkday. Civil War Weekend activities officially kicked off on Wednesday, but there are a number of other events taking place Friday-Sunday around the area. See if one of these events catches your eye! This special program, led by Ranger Jeff Driscoll, will give an in-depth tour of the construction and history of Star Fort. For more information click here. “Establishing a New Normal: The Fighting is Over, Now What?” Jonathan Noyalas will present “The African-American Community in Stephens City and Beyond,” at 11am, Ann Denkler will present “African-American Women in the Shenandoah Valley,” at 1pm, and Kenneth Rowlette will speak on “Civil War Chaplains During and After the War,” at 3pm. Author Jonathan Noyalas will sign his new book, Civil War Legacy in the Shenandoah: Remembrance, Reunion, and Reconciliation. 1400 S.Pleasant Valley Road. Join the Newtown History Center for a special walking tour focusing on the Town’s Civil War history. For more information, click here. Belle Grove in the Civil War Tours: These 45-minute tours will discuss the occupation of Belle Grove Plantation during the Civil War, especially in the Shenandoah Valley campaigns of 1862 and 1864. 335 Belle Grove Road, Middletown. A special 2-hour walking tour along some of the most well preserved entrenchments in the Shenandoah Valley. How were they constructed and what was their role during the battle. Meet at 7712 Main St., Middletown, Va.
Quilt Show, Tea Shop, Cannon Exhibit, Battlefield and Pritchard House Tours: The Kernstown Battlefield Association will exhibit a unique collection of Shenandoah Valley applique and pieced quilts created in the era 1840-1900. A “Bonnie Blue” quilt raffle will be held, and concessions will be available. Pritchard House Tours will be conducted hourly. View the Gilder Lehrman Institute’s exhibit, Emancipation and Its Legacies, July-August. The focus of this exhibit is the story of emancipation from 1850 to 1964. Enjoy a showing of the movie Glory Saturday evening (8pm) to kick start Long Branch’s Outdoor Movie Series. Family Fun and History Days at Jackson’s Headquarters. Experience the sights, smells and sounds of a Confederate Infantry encampment, including real musket firing. National Park Service Rangers will present on Stonewall Jackson’s 1862 Valley Campaign. The following is a guest contribution by the Winchester Chapter of the Embroiders’ Guild of America (WEGA) and the Multicultural Club Collage (MCC) of Frederick County, VA. I invite you to read on and learn how you can contribute to this community project to recreate a familiar painting as a hand stitched tapestry. Many of our readers live in or own one of the historic houses depicted in the tapestry, and we encourage you to reach out to contact the Valley Tapestry project leaders and become involved in the process. It all started with the book – Defend the Valley by Margaretta Barton Colt. The book tells the story of the Civil War through the letters and private papers of the Barton and Jones clans—two great limbs of one family tree with roots in Winchester. The Bartons and Joneses collectively sent eleven men into battle, most in the brigade led by Thomas “Stonewall” Jackson. Defend the Valley presents a fully rounded picture of the daily struggles of ordinary families living through the Civil War and a documentation of the passing of a way of life. The book led to the contemporary primitive painting by Page Huff Dillon – “Winchester & Frederick County, Virginia,” (1995), commissioned by Margaretta Barton Colt. 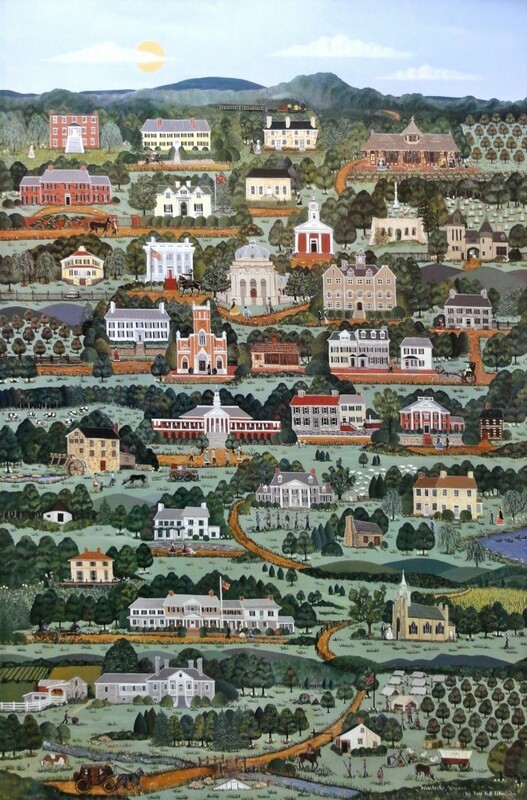 Cissy Shull, Executive Director at Winchester–Frederick County Historical Society, presided over a group of historians who acted as consultants to ensure the historic accuracy not only of the painting’s thirty-four buildings, but also the landscape, people, and lifestyle in the Valley. The painting is well known to many citizens of Winchester and can be seen in a number of local offices and homes. The “Tapestry” project is spearheaded by the Winchester Chapter of the Embroiders’ Guild of America (WEGA) and the local community advocacy organization, the Multicultural Club Collage (MCC) of Frederick County, VA. Working together and serving as the Directors of the Tapestry project, the WEGA and MCC have been joined by The Handley Regional Library, the Winchester-Frederick County Historical Society, and the Kernstown Battlefield Association to bring “The Shenandoah Valley Tapestry” to life. The promotional celebration highlighting the book, the painting, and “The Tapestry” is scheduled for November 14, 2015 at the Handley Regional Library and November 15, 2015 at Kernstown Battlefield. Margaretta Barton Colt is the keynote speaker for these events where she will also be available for book signings of Defend the Valley. We have just started working on “The Tapestry”, but are making good progress. The buildings, people and landscape have been outlined in place on the background canvas fabric, the sky has been quilted, and several buildings are “under stitching construction.” It is an exciting time and we want “The Tapestry” to be a true community project, for and by everyone, from the smallest children, to teenagers, to people who want to just make one stitch, to mature experienced stitchers. Some needlework skills are welcomed but not required – we can teach you! We will host workshops and stitch-ins, story times, and classes in embroidery at the Handley Library. Everyone who participates will sign “The Tapestry” log book, a permanent record accompanying “The Tapestry” that identifies each participant. You can make just one stitch and get your name in history! “The Shenandoah Valley Tapestry – a Journey Through Time” has its very own Facebook page. Take a look and like us on Facebook where you will see photos of our kick-off event: the first stitch taken by Jennifer Sutter of the Handley Library. Upon completion, the Kernstown Battlefield Association and the Handley Library have expressed their willingness to host “The Tapestry” and build programs around it, both for the community and also to support historic education and preservation, and encourage heritage tourism. We believe “The Tapestry” project can help protect and promote Winchester and environs historic resources because it will help generate tourism dollars through marketing and advertising of these buildings and sites. First of all we would like to see among our participants and sponsors those who are representing organizations and families – owners and business associated with the buildings and sites depicted in the painting. Each building / site sponsor will be identified in “The Tapestry” promotional materials, to include events hosted at Kernstown Battlefield and the Handley Regional Library. Business or company logos are welcome as part of a sponsor’s identification. In addition, a special plaque identifying each sponsor will be created to accompany “The Tapestry” wherever it is hosted. We are in the process of identifying the owners/businesses/residents of each building and site, but we still need a little help. Attached is a list of the buildings and sites and what contact information we have been able to gather so far. As a member of PHW we are asking you for your help in verifying the information we have, helping us fill in the missing information, and we are especially anxious to meet with each building and site point of contact. If you can help us complete the building and site contact information, please contact us at valleytapestry@gmail.com or call us at 703-608-3924. We are also happy to announce that each building and site is available for sponsorship. All funds donated to “The Tapestry” go toward providing tapestry linen, stitching threads, needles and other stitching materials, framing materials, promotional materials, etc. to bring “The Shenandoah Valley Tapestry – A Journey Through Time” to life. Any excess funds remaining upon completion of the project will be managed by the Winchester–Frederick County Historical Society and designated for the conservation of the Tapestry. No administrative expenses are associated with this Project. All funds donated are totally and fully tax deductible according to the IRS rules for 501-C3 non-profits. Checks should be made out to Winchester–Frederick County Historical Society with a special designation in the note section for the Tapestry Project. If you want to help us bring “The Shenandoah Valley Tapestry – A Journey Through Time” to life as a sponsor, if you have any questions, or if you are interested in participating in the wonderful community based heritage “Tapestry” project, contact us at valleytapestry@gmail.com or call us at 703-608-3924. Addition 8/18/2015: In November, Margaretta will be also presenting, selling, and signing her new book: Martial Bliss: The Story of The Military Bookman, which tells the story of how she wrote Defend the Valley. Presentations will take place November 14 at the Handley Library and November 15 at Kernstown Battlefield. Celebrate the 151st anniversary of the Second Battle of Kernstown this Saturday, July 25 with a civilian lawn party. The free event will feature period lawn games with reenactors in period clothing. Visitors are encouraged to bring a picnic and wear period attire. Professor Jonathan Noyalas will conduct 90 minute tours from 10:30 a.m. – 2 p.m. focusing on the Second Battle of Kernstown and the Pritchard family and farm. Cost: Free admission, but reenactor registration is encouraged. Carnival-fare food will be available for purchase. Learn more at: Facebook or kernstownbattle.org. Although we were not able to produce a PHW blog post this week, we thought you might enjoy two videos by William Bechmann featuring the trails and markers along the Kernstown and Third Winchester battlefields. Given our current weather, a view of sunny green fields and trees just starting to change to autumn foliage may entice you to visit these Civil War sites this spring. Our Special Artist and Correspondent at the head-quarters of the Confederate army of Northern Virginia has forwarded to us some Illustrations, which we have been fortunate enough to receive. This, it seems, is far from being the case generally, many of his sketches and letters having been intercepted. . . . Indeed, our Special Artist on one occasion recently ran a great risk of being taken prisoner, having galloped past a cross-road only a few minutes before a Federal scouting-party dashed through. When Banks, commanding the Federals, was attacked by Jackson last spring and driven pell-mell through the streets of Winchester, Miss Laura Lee, of that city, boldly stood forward on the street amidst the flying bullets and waved this little flag of her own make, cheering on the Confederate soldiers as they charged through the flying ranks of those who had covered her and her fellow-citizens with abuse for months. More than one Confederate fell at her feet as they swept triumphantly past, and, still waving her little flag in one hand, with the other assisted the wounded men. This lady is a fair type of all her Southern sisters – womanly, but brave in her country’s cause, and now praying by the dying beds of those brave men who have fallen victim to patriotism. The final image of the set is from a different, also unnamed artist, depicting men claiming exemptions from the draft in New York in the fifteenth ward in November of 1862. The paper records that “there has been a great rush” to claim exemptions, which were granted for those under age 18 or over 45, physical disability, color (“no negroes or mulattoes being accepted”), “alien birth and non-naturalized” status, or “membership in the scholastic and clerical professions.” The most numerous exemptions were granted to non-naturalized citizens, with allegedly 50,000 exemptions being granted. View the set on Flickr.